Some people think it’s really cool living with a cat. That’s because they have no idea what their cat is thinking. Cats look so innocent and sweet. But deep down inside they are plotting how they can get you. And when they do something mischievous they purr and rub against you and pretend to be ever so innocent. And the dog always gets blamed. You wouldn’t believe how many times I get blamed for things that Scratchy does. I don’t know why everybody looks to me first. I’m such a perfect dog. I don’t do anything wrong. I just wish my people would realize that. When there’s garbage on the floor – it was the cat. When the covers are messed up on the bed – it was the cat. 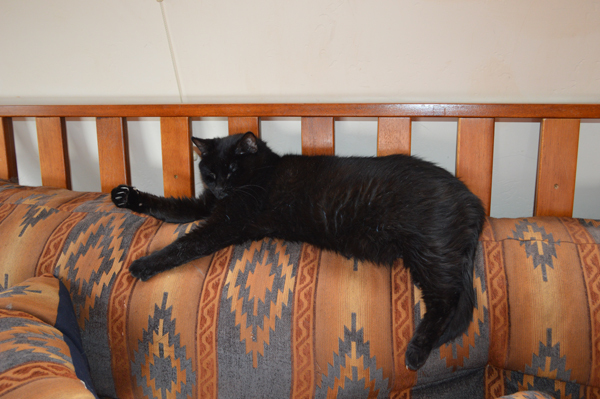 When my hair is all over the furniture that I’m not supposed to be on – it was because Scratchy rubbed up against me and put my hair there. But finally, I’ve caught Scratchy in the act. He was up to mischief and no way can he deny it. And I kind of blame my person for this too. She put food in my dish before I came back in the house. I can’t help it if there were some new smells outside that I had to check out. That’s my job, isn’t it? Making sure the yard is safe from anything causing strange odors. So anyway, when I did come in I caught Scratchy in the act. And it’s sure good I caught him when I did. because I would have starved to death. Don’t ever live with a cat. P.S. I have some blogging cat friends and they’re okay. They never eat my food. Ku, Scratchy’s biggest problem was that he never wanted to play with me – until he started eating my food, that is. Cats, maybe I should send Scratchy off to travel with you. Then he couldn’t eat my food anymore. You mean that because of Scratchy we might have been without a post from Bongo today?! Marina, it was a good thing I caught Scratchy before he ate all my food. Of course I could have gone to visit you for some fish. And I wouldn’t share any with Scratchy. That is so rude of Scratchy to eat your food. I am SURE you’d never eat his food….. Or would you???…. Cupcake, I eat Scratchy’s food every time my person leaves the house and forgets to put it out of my reach. But that’s different. Scratchy needs to lose weight anyway. Strange, my dogs usually eat the food of the cats. Not saying the cats always behave. You’re probably right and they put dog hair everywhere as faked evidence. But my cats don’t even like the dogfood. They are very picky, and I’m happy if they eat their own. We got some mouse-restaurants in the vicinity. Stanze, it’s only been recently that Scratchy decided he likes my food. A terrible thing to happen to a dog. I do have to admit that his food tastes pretty good. Oh, sympathy, Bongo. All that hair on the floor – it’s the cat trying to craft more cats. 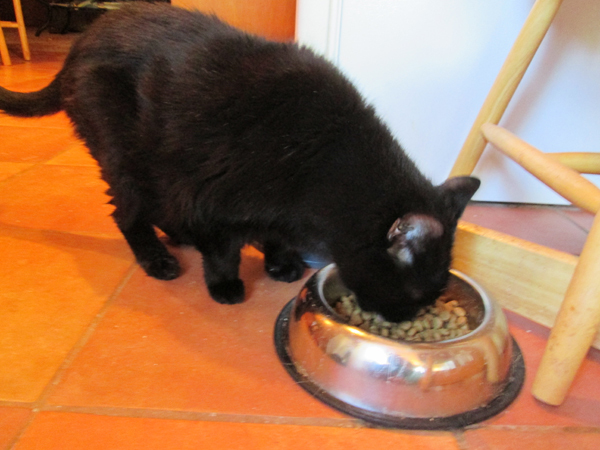 RC tries to sneak in at night and eat any leftovers in Molly’s bowl – but it gives her gas….staff found that so annoying, they pick up my bowl at night. HA! Winner! Karen, RC and Scratchy are two of a kind. At least Scratchy can’t get anything out of my bowl at night. I don’t leave anything in it. Benny & Lily, I so agree with you. Mr. Ched says “right on” !!!! Mr. Ched, you wouldn’t eat any of my food, would you? Wow Bongo, I’m sure glad you caught him and you’re not actually starving buddy – If you ever need a break and to eat in peace, come on over, it’s a cat free zone here! Snoopy, your house sounds like heaven. I’m on my way! Alfie, don’t worry. I’ll be stealing Scratchy’s food every chance I get. Oh yeah, I already do that anyway. Kevin, I just heard another cat story – at least it wasn’t my cat, or your cats. But a friend’s cat knocked a cell phone off a night stand and right into a glass of water. Cats can be so difficult. I always knew it was Scratchy Bongo! At last he is caught in the act. You could try it the other way around – does cat food taste as good as dog food? No? its horrible? No wonder your poor food dish is always under seige then! Susan, I think cat food tastes really good. Oops. You weren’t supposed to know that. All three of my dogs agree with you Bongo. Cats are evil. But, we have a couple living here too, so they have to learn to deal with them, unfortunately. Guess you’re in the same boat. Donna, living with cats is a real challenge. And it sounds like your dogs are in double trouble. At least I only have to live with one cat. Little Binky, I love cat food. I might have trouble waiting. Ginger, I’ll help you put that solution into effect.